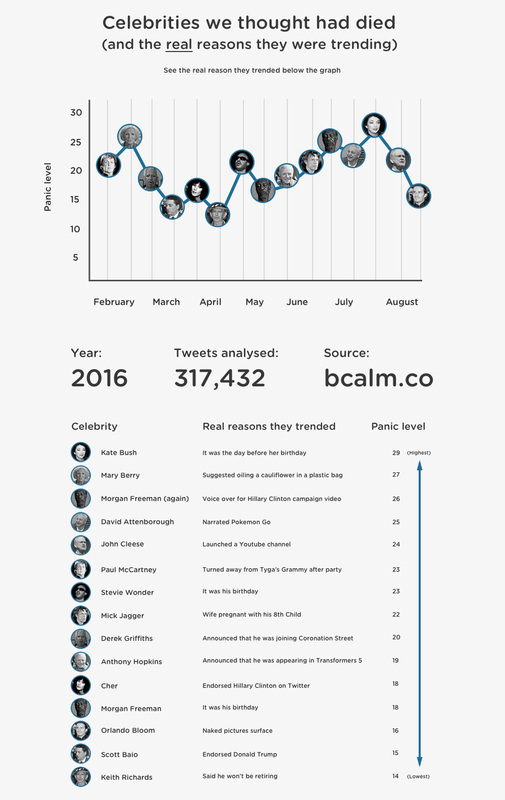 90% of social media users say they experience a “moment of panic” when they see a celebrity trending, according to new research conducted on behalf of bcalm. Of those who’d experienced a Twitter trend-induced moment of panic, 8 out of 10 (79%) say the number of high profile celebrity deaths in 2016 have made them more sensitive to seeing news about their favourite celebrities on social media. The study findings are based on social media sentiment analysis, applied to more than 300,000 individual Twitter, Facebook and Google News posts and a poll of more than 1,000 UK adults. “Social media has conditioned us to expect bad news. Given the amount of unexpected high profile deaths we’ve seen in 2016, we’re wired to be on high alert. “So when we see our favourite celebrity trending, it’s quite understandable that we feel a moment of panic. 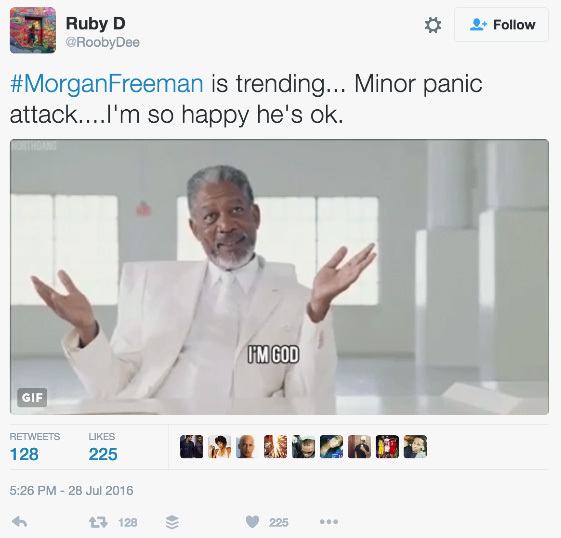 Morgan Freeman is the most panicked-about celebrity worldwide so far in 2016, causing two separate spikes – one in June and one in July. Kate Bush is the most panicked-about UK celebrity – she caused a spike in panic when she trended in July. Older TV personalities and actors, such as Freeman, 79, Mary Berry, 81 and John Cleese, 76, tend to cause more intense reactions, with the related tweets frequently featuring words and phrases such as ‘panic,’ ‘moment of dread’ and ‘anxiety’. Musicians caused broader panic across social media, possibly due to them having larger fanbases than actors and TV personalities, but it was of a less intense nature. Kate Bush July 29 29 It was the day before her birthday. Mary Berry February 29 27 She suggested oiling a cauliflower in a plastic bag, mild Twitter storm. Paul McCartney February 16 23 Turned away from Tyga’s Grammy after party. Social media’s less popular and controversial figures are more likely to cause a stir of a different kind, with social media users regularly expressing mock disappointment that the curse of 2016 hadn’t struck upon seeing them trending. Katie Hopkins, Kelvin McKenzie, Piers Morgan and George Zimmerman, the American who was acquitted of murder after shooting and killing 28-year-old Trayvon Martin, generated the highest amount of negative sentiment when they trended, collecting thousands of disappointed posts between them. We analysed the sentiment of more than 300,000 results from Twitter, Facebook and Google News about trending celebrities, using a variety of sentiment and content analysis tools. Terms such as ‘panic attack,’ ‘panicked’ and ‘worried’ were among the most common modifiers in social media posts about trending celebrities. We discounted content where a high volume of posts contained the words ‘hoax’ and ‘prank’ to eliminate stories in which a celebrity’s death was falsely reported. We discounted social media posts related to celebrities, public figures and entities that trend regularly, such as ‘Donald Trump’, ‘Justin Bieber’ and ‘1 Direction’. The intensity of sentiment and volume of activity were combined to give each celebrity trend a score out of 30, with 30 being the highest. Social media content analysed was published between the dates of February 1st 2016 and August 1st 2016. To determine to what extent a trending celebrity caused panic or anxiety among users, we polled more than 1,013 UK adults aged between 18-40, between the dates of July 11th 2016 and August 1st 2016.